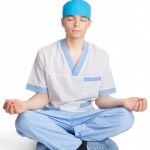 The research is becoming overwhelming that Mindfulness Meditation is the most powerful moment to moment stress reducing, burnout preventing technique for physicians. The challenge is getting that awareness out of the ivory towers of research and translating it into simple techniques a practicing doctor can use on the fly. Leo has one of the most popular blogs in the world and teaches Zen meditation techniques in little bite size chunks. Here is a post from the blog Uncommon Student MD outlining how to get started in meditation using tips from Leo’s blog. Very simple and powerful stuff. Click the link and check it out for yourself … and keep breathing.